Solomon's marriage. (1-4) His vision, His prayer for wisdom. (5-15) The judgment of Solomon. (16-28)1-4 He that loved the Lord, should, for his sake, have fixed his love upon one of the Lord's people. Solomon was a wise man, a rich man, a great man; yet the brightest praise of him, is that which is the character of all the saints, even the poorest, "He loved the Lord." Where God sows plentifully, he expects to reap accordingly; and those that truly love God and his worship, will not grudge the expenses of their religion. We must never think that wasted which is laid out in the service of God. 5-15 Solomon's dream was not a common one. While his bodily powers were locked up in sleep, the powers of his soul were strengthened; he was enabled to receive the Divine vision, and to make a suitable choice. God, in like manner, puts us in the ready way to be happy, by assuring us we shall have what we need, and pray for. Solomon's making such a choice when asleep, and the powers of reason least active, showed it came from the grace of God. Having a humble sense of his own wants and weakness, he pleads, Lord, I am but a little child. The more wise and considerate men are, the better acquainted they are with their own weakness, and the more jealous of themselves. 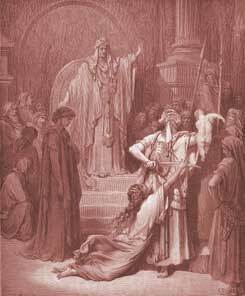 Solomon begs of God to give him wisdom. We must pray for it, #Jas 1:5|, that it may help us in our particular calling, and the various occasions we have. Those are accepted of God, who prefer spiritual blessings to earthly good. It was a prevailing prayer, and prevailed for more than he asked. God gave him wisdom, such as no other prince was ever blessed with; and also gave him riches and honour. If we make sure of wisdom and grace, these will bring outward prosperity with them, or sweeten the want of it. The way to get spiritual blessings, is to wrestle with God in prayer for them. The way to get earthly blessings, is to refer ourselves to God concerning them. Solomon has wisdom given him, because he did ask it, and wealth, because he did not. 16-28 An instance of Solomon's wisdom is given. Notice the difficulty of the case. To find out the true mother, he could not try which the child loved best, and therefore tried which loved the child best: the mother's sincerity will be tried, when the child is in danger. Let parents show their love to their children, especially by taking care of their souls, and snatching them as brands out of the burning. By this and other instances of the wisdom with which God endued him, Solomon had great reputation among his people. This was better to him than weapons of war; for this he was both feared and loved. What a landmark judgement, fit only to be inspired divinely. Solomon could not have asked for a better gift from God. "Is it so, that there is not a wise man among you? one who is able to judge between his brethren?" and, "why even of yourselves, judge ye not what is right?" It is a bad teaching that says we as Christians are not to judge. "Know ye not that we shall judge angels? . . . Know ye not that the Saints shall judge the world?" How else are we to keep the Lord's house clean and safe from wicked spirits? Irene (cont.) and when Solomon had that dream when God appeared to him, and told him to ask whatever he wanted; what was in his heart was to be like his father David in his ability to care for Israel. If he had secret pride, as you say, how did God not see it afar off, and confront him with that evil in his heart? you are mistaken about that! God saw what was in his heart, and was pleased to give. Hi Irene; the way I read about David, the Lord's testimony of him was for ever after, that David walked with God with a perfect heart all his days, (except in the matter of Bathsheba), and that he was a man after God's own heart. He very much did often ask (read the Psalms!) for wisdom and guidance. Solomon was as a child in his own eyes, when he was called by God to step into David's shoes . . .
David wasn't perfect. But, he never asked for the wisdom for himself to judge GOD'S people; GOD'S people, not his. Solomon had a hidden sin in his walk - that only knew of: pride. He should have learned from David that God is FAR wiser in judging His people than man is. Solomon asked for something that was the province of only God. God had His reasons for granting his prayer for wisdom. If any of you lacks wisdom, you should ask God, who gives generously to all without finding fault, and it will be given to you. 6 But when you ask, you must believe and not doubt, because the one who doubts is like a wave of the sea, blown and tossed by the wind. 7 That person should not expect to receive anything from the Lord. 8 Such a person is double-minded"
Our leader may find deficult to get the wisdom like king solomon because they dont have faith in God. What Do You Think of 1 Kings 3? How many burnt offerings did Solomon sacrifice at Gibeon?